In hands-on testing, PT found that a cluster powered by AMD EPYC 7601 processors could provide more operations per second compared to a cluster based on Intel Xeon processors E5-2699 v4 when running Apache Cassandra workloads. Durham, NC, December 21, 2017 --(PR.com)-- Private clouds that run demanding NoSQL applications such as Apache Cassandra need hardware that can provide strong performance. Principled Technologies (PT) tested a cluster based on AMD EPYC 7601 processors, and found that it could deliver up to 50 percent more operations per second compared to an Intel Xeon E5-2699 v4 processor-powered cluster when running Apache Cassandra workloads. 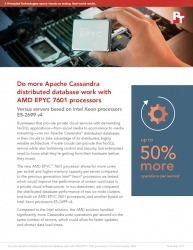 To learn more about how NoSQL applications in a private cloud could benefit from the AMD EPYC 7601 processor, read the full report at http://facts.pt/2tzC3h and see the infographic at http://facts.pt/6e5dza.